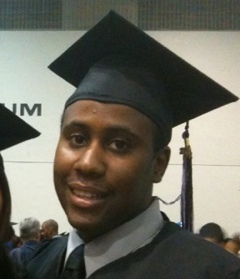 Today at 12:30pm my younger brother officially graduated from college. Of the three of us, he is the last one of my parent’s children to march down the isle with his B.A. in hand. It was also a bitter-sweet day for my family as well. While I was elated to be there to cheer him on, and film his march, I had to admit that the day was missing something–at first. Special events are going to be hard to my family, I can just imagine how hard it was on my brother. My dad managed to see my sister and me graduate from college, but it was a year after I graduated that he became I’ll, and managed to live for another year before he passed away. Seeing my brother wearing his cap and gown, I know that my dad must be proud. My parent’s goal was to make sure that each of their children graduated from college, and with my brother finally completing the circle, their wish came true. It’s funny how you never know how much you are going to miss someone until they are gone, and you won’t know how much you need them until they are no longer there. Even though our father couldn’t be there physically, I know that he was there with us spiritually. It was awkward at first, but we managed to get a rhythm And stick with it. The weather was great, my brother did great, there isn’t anything that I could add to it. My daughter even behaved herself on the train and in the restaurant. I was actually complimented by people about how well behaved she was (not running around the restaurant throwing things–that is only reserved for home). Overall, it was a great day. I could be biased, but any day that would wipe my daughter out is a good great day for me.